Spring has sprung…and you know what that means? Pretty baked things to celebrate the season! 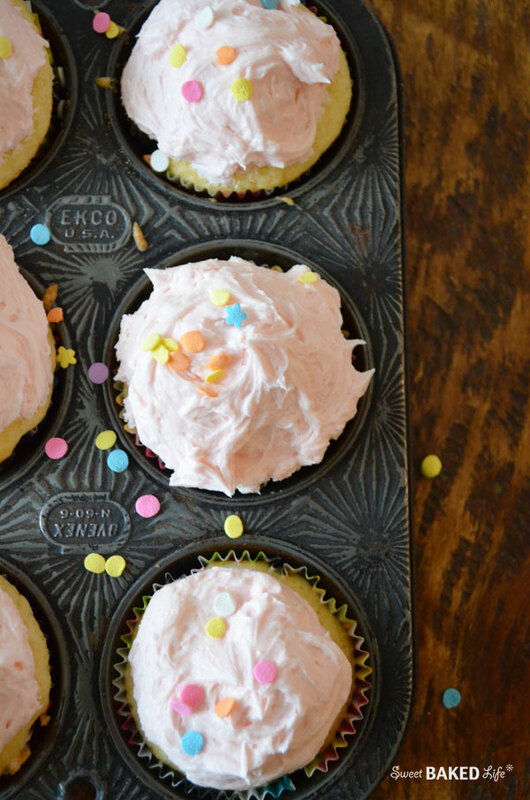 So get ready to bite into these scrumptious pastel pink Honey Vanilla Cupcakes. And don’t you just love this vantage muffin tin? Well, one of our neighbors is selling their house and they recently had an estate sale. I walked into the garage where they had all of their kitchen things neatly placed when my eyes immediately spotted two worn out and rustic muffin tins. I reached over and plucked them off the table and nonchalantly asked the guy manning the wares the price, “three dollars for both”, he said. SOLD! I could not beat the price — best purchase in a long time! And don’t they look great next to the pretty pink frosting? I quickly walked back to my house and knew exactly what I was going to make, right then and there! These Honey Vanilla Cupcakes start with a basic box cake mix which is dolled up with almond milk, melted butter and honey and then they’re frosted with a slathering of incredible light pink honey vanilla buttercream frosting. Top these gems off with some pastel sprinkles and you’ll be set! Set for what, well to celebrate the season of course! Heat your oven to 350 degrees. Line muffin pans with pretty liners and set aside. Note this recipe yields 18-24 cupcakes. In a large bowl, add all of the ingredients for the cupcake batter. With a hand-held mixer, beat on medium speed for 2 minutes. Pour or spoon batter into prepared muffin pans and bake for about 18-20 minutes. Cool completely on a wire rack before frosting. For the frosting: in a large bowl of an electric mixer, add sugar butter and honey and beat on high-speed until fluffy, slowly add the vanilla extract and milk. Note, if frosting is too thick add more milk or if too thin add more confectioners sugar. 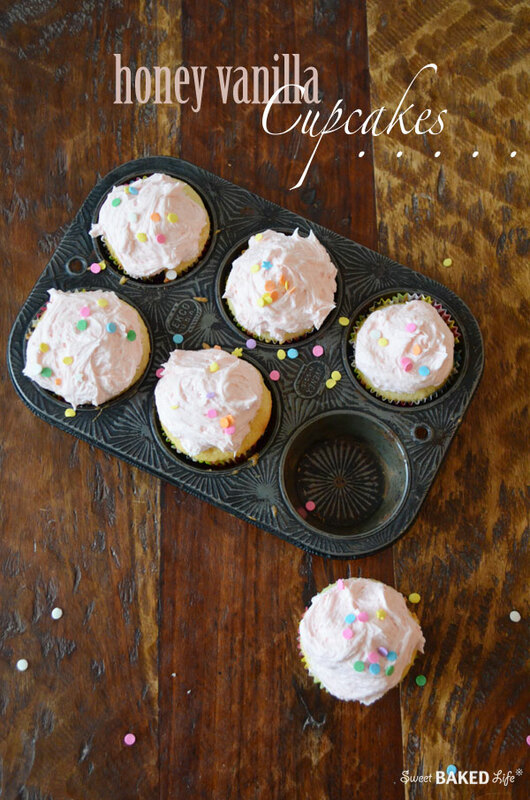 Frost cupcakes and sprinkle with pretty sprinkles. 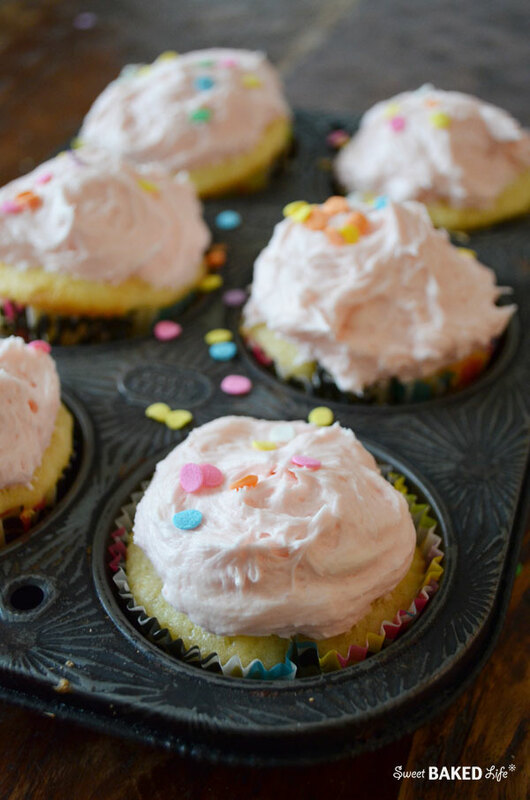 These moist Honey Vanilla Cupcakes are perfect for Easter or any springtime celebration. Here’s to the spring and pretty things! I always get so excited when I find a cool piece of fabric or an awesome prop to use in my baking and food photography! The vintage muffin tin is totally awesome :). Also that honey vanilla frosting sounds amazing! I may have to make it and just eat that from the bowl because I don’t know if I can wait long enough to bake cupcakes haha. Sheila, that IS a gorgeous cupcake pan! I can just imagine the excitement when you laid your eyes on them! 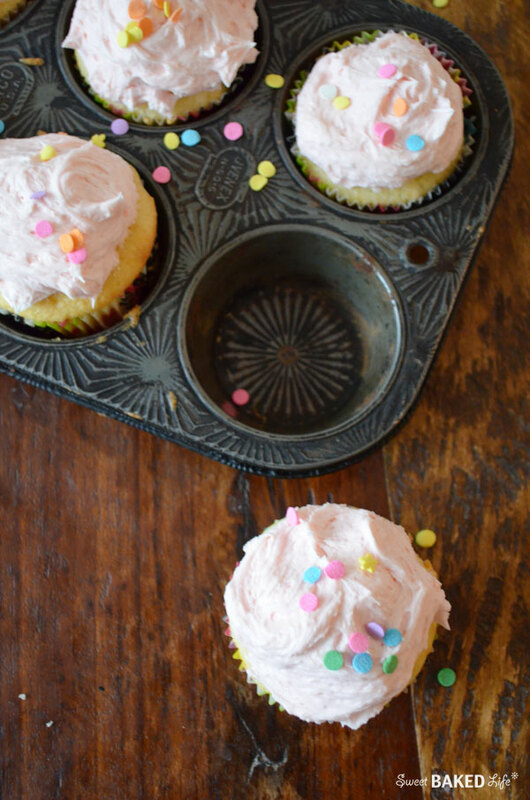 What a fun recipe you made for this muffin pan… so pretty! Thanks Gloria! And yes, I tried really hard not to show my excitement when I handed over my $3.00!!!! 🙂 the other one I got has 12 openings, and I can’t wait to make something in it and photograph it! You are too funny! (We are so alike!) Happy you shared these at the Show Stopper this week… they rock! I’m sharing these on FB this afternoon. Hope you have a wonderful Thursday, my friend!